It took six years for Tony Sanchez to lead Bishop Gorman High School to a mythical national championship. Now comes an even bigger challenge … turning downtrodden UNLV into a winning FBS program. Sanchez, 40, will be introduced as the school’s 11th football coach on Thursday, replacing Bobby Hauck who resigned after a 2-11 season and an overall record of 15-49 in five years. 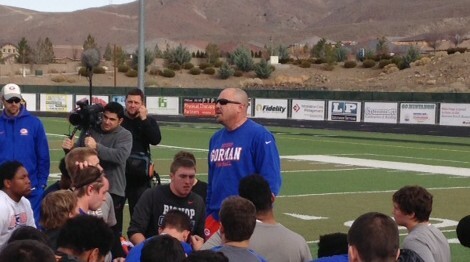 Sanchez posted an 85-5 record at Gorman including a 15-0 mark this year against one of the nation’s toughest schedules. He becomes just the third high school coach to jump to a FBS head coaching job joining Todd Dodge (North Texas) and Gerry Faust (Notre Dame). UNLV has played in just four bowl games in school history and has won only two games in a season eight of the last 11 seasons. The school is also battling to stay afloat of possible NCAA sanctions for low APR scores. Still, Sanchez, who arguably had better facilities and players 15 minutes west at Gorman, wanted to tackle the challenge of college coaching. Sanchez’s brother, Kenny, who has drawn high marks for his job as his defensive coordinator for the Gaels, is expected to stay and take over as head coach at Bishop Gorman.